Looking at political developments and processes in Iraq and Lebanon and trying to compare or contrast them is not always an easy task: on the one hand, Iraq – despite being only one and a half hours away from Lebanon by plane – appears very far off. Iraqi political developments often go unnoticed in Lebanon, and usually have no direct repercussions on the country’s political stage or vice-versa. Iraq’s political developments in the last decade, on the other hand, share several striking similarities with Lebanon: the confessionalization of politics and society, the presence of rival militias connected to sectarian leaders and communities, a political system and state that can be described as weak and corrupt but to a certain extent stable, a high degree of social and economic injustice, as well as a political discourse revoling around political personalities rather than issues or ideologies are only some of the characteristics that can be observed in both countries. Recent weeks have been particularly conducive to such a comparison, as both countries held parliamentary elections within one week of each other (Lebanon on 6 May 6 and Iraq on 12 May). Previously scheduled elections had been postponed for alleged security reasons in both countries –for a couple of years in the Lebanese case, and a couple of months in Iraq. In both countries, protest movements had taken to the streets in the summer of 2015 denouncing confessionalism, corruption and threadbare public services. In both countries, the reverberations of these two movements (called “al-hirak”, Arabic for “the movement”, in both countries) could be seen in the 2018 election campaigns: in Lebanon with the independent civil society candidates running on different lists in several districts, many of them protagonists of the 2015 hirak; in Iraq with the “sayiroun” list comprising a coalition between the Sadrist movements and the Iraqi Communist Party (ICP) as well as some other smaller secular parties. Similar to the Lebanese civil society coalitions, the alliance between the Sadrists and the Communists was a result of the 2015 protest movement, where the two movements joined forces for the first time. The timing of the two elections as well as the presence of remnants of the 2015 protest movements in both allow us to shed light on the process and compare different issues at stake in Iraq as well as in Lebanon. Iraqi and Lebanese electoral laws for parliamentary elections both rely on proportional representation, with 15 (Lebanon) and 18 (Iraq) electoral districts. While the confessional quota for each sect in the Lebanese parliament is predetermined, the Iraqi constitution only includes a women’s quota of 25 % minimum representation and eight seats reserved for ethnic and religious minorities in parliament. Both electoral laws are based on semi-open lists, meaning that each voter can choose one preferred candidate from the list she votes for. Both electoral laws are fairly new, and the result of a longer political process. The Lebanese electoral law was adopted in June 2017, replacing the old majority voting system in place since 1960 and rightly criticized for favouring the same big political parties. Today’s law – applied for the first time in the 6 May elections – was the outcome of year-long negotiations that mainly revolved around the size and number of the electoral districts. The Iraqi electoral law was adopted in 2005 but altered for every parliamentary election (2005, 2010 and 2014). Since 2010, each province has constituted an electoral district, while since 2014 seats are distributed according to the Sainte-Lague/Webster method whereby the quotient of each party changes according to seats allocated to that party. The divisor is fixed and rather high (1.7) compared to other countries where the divisor is between 1 and 1.4. Electoral law is a contested question in both countries, in which similar grievances are expressed. In Lebanon, the adoption of the new electoral law brought an eight-year deadlock without parliamentary elections to an end; the new law is still considered the lesser of two evils, but still “evil” in the sense that it helps the same political elite and big political parties to maintain their power base in the country. In Iraq, the electoral law is a constant issue of protest and contestation, with several demonstrations in 2016 and 2017 by different oppositional movements accusing the law of returning power to the same political elites. Grievances in both countries are largely attributed to the existence of a preferential vote (favouring personalized and individualized campaigning over political programmes and ideas) as well the distribution of the electoral districts (favouring the reliance of each candidate on certain social or confessional groups without appealing to others). In Iraq, the high divisor of the Webster method places smaller parties at a disadvantage. Oppositional political movements and activists lament the high bar for change and reform set by the electoral practice in both countries. Therefore, these movements in both countries seem to be caught between two decisions: to attempt participation in the democratic rule of politics despite significant barriers, or to boycott any participation and instead focus on political activism and oppositional action outside of the institutional framework. The 2018 elections demonstrated this dilemma and the various strategies that different political actors pursued in light thereof. Though differing immensely in geographical size, population as well as ethnic and sectarian diversity, contemporary Iraq and Lebanon share some striking similarities in the nature of their political systems and national elite. Both rotate in a vicious but stable cycle of confessionalism, corruption and capitalism – especially vicious for the majority of the population who are the main losers of this cycle, stable mainly for those in power who profit from it. The political systems of both countries are based to a certain extent on a power-sharing formula that takes the confessional diversity of the two countries into account. While Lebanon has a comprehensive confessional quota system for all government and public positions, Iraq has a similar power sharing system in senior government positions as well as the judicial system. Moreover, in Iraq it is rather the political practice in the last decade that consolidated sectarian divisions. While political realities in both countries are often explained and reflected primarily in terms of this confessional political framework, the political system and practice in both countries must be fine-tuned by other parameters that feed into these confessional set-ups. The political rule in both countries is contested and simultaneously shared by a political elite that ppears rather fragmented and divided in terms of ideology, affiliation and political practice but generally agrees on the unconditional maintenance of the status quo. Their power is based largely on a stable system of corruption and paternalistic networks of clientelism, where different political leaders serve their supporters in a more or less stable fashion by providing public services, money, employment and protection. Both Iraq and Lebanon stand out due to their high levels of corruption, poor governance and high political factionalism. Both countries base their economy on a laissez-faire capitalist system with rather weak industrial and business sectors and little social security offered by the state. The victims of this system or vicious cycle are the wider population in both countries, “wide” in the sense that there are little ethnic or sectarian exemptions or exceptions to their victimhood. Victims due to high dependencies on political leaders, instability and inequality in the provision of public goods and services, high unemployment and poverty and a rather poor guarantee of social, economic and human rights. The maintenance of the established political system is ultimately guaranteed by the high probability of the exercise of direct and indirect violence by the political elite itself. Lebanon and Iraq not only have a long history of different forms of violence and (civil) wars in recent decades, but the possibility of a return to these forms of violence is a vivid and a constant part of the political discourse that can be mobilized against any kind of threat. When looking at the political systems in Lebanon and Iraq and any political, seemingly democratic practices within these systems as well as oppositional activities, one must always consider the high uncertainties triggered by the constant probability of violence. The political systems described above – guaranteeing a minimum of state viability for its citizens with a maximum of dependency from these citizens – clearly restrict an often marginalized but broad sense of oppositional sentiment. These range from general grievances about poor public services to longer-ranging oppositional movements and ideas that oppose the political status quo. Still, due to the rather stable nature of the political system, these oppositional movements are often rather marginalized and operate outside of political institutions. In both countries, leftists groups and movements are an essential part of these oppositional trends and have experienced different highs and lows throughout their role as opposition to the political system. Moreover, these leftist actors also often faced criticism for not offering enough of an alternative to the existing status quo. In summer 2015, both countries experienced a series of protest movements that brought together more established left-wing actors and groups with emerging political activists and newcomers on the streets, primarily mobilized by the grievances they faced in daily life. While the main trigger for the protest movement in Iraq was the frequent power cuts in the middle of a hot summer, in Lebanon, demonstrators flocked to the streets mainly due to large piles of accumulating garbage. Both protest movements not only gained ground quickly and developed into large-scale demonstrations, but the issues raised by the demonstrators soon exceeded garbage and electricity and began to revolve around demands for a broader reform of the political system, the revision of confessionalism as well as the fight against corruption and bad governance. While both protest movements initially appeared rather overwhelming in terms of numbers, demands, as well as sectarian, class and gender diversity, both movements failed to transform the momentum of street politics into a longer-lasting political vision and practice challenging the status quo. In Iraq, many groups withdrew from the protest movement after Muqtada al-Sadr and his supporters joined the movement and eventually dominated it. In Lebanon, the different groups within the protest movement began to differ on topics such as the radicalism of demands, the position towards the Syrian regime and Hezbollah, the inclusivity of the hirak itself and the question of violence of and towards state institutions. Disagreement on these issues gradually led to the protest movement’s dissolution. Still, in both countries, the hirak was not only an outcome of a decade-long politics of contestation and political mobilization, but also left traces within the political landscape: in Iraq, mainly as a renewal of a regularity of street politics and demonstrations within the last couple of years; in Lebanon, primarily in the 2016 local elections and the rather high vote tally in many regions for lists comprised of independent oppositional candidates with a new approach to local politics. With the 2018 parliamentary elections, these traces of the hirak exhibited a renewed attempt of playing politics in both countries. In Iraq, this attempt can mainly be seen in the coalition of the “sayiroun” (“walking/going towards”), an alliance between the Sadrist movement and the ICP together with some smaller secular parties. The coalition’s electoral programme is mainly constructed around the building of a civil, sovereign and strong central state based on citizenship and social justice. The main topics addressed in the program are the fight against terrorism, national reconciliation and unity, a new electoral law, improved governance and fighting corruption, and guaranteed access to human and social rights (education, social security, living standard, and housing). Although focusing on topics of social justice, poverty and corruption, the sayiroun also stand for the reform of the sectarian political system and clearly position themselves against Iranian influence and dominance in their country. The unlikely alliance between the Communists and the Sadrists has not been without criticism within leftist as well as Sadrist circles. For many leftists, Sadr first hijacked the protest movement and then the ICP, while the ICP mainly sold its political ideas and principles to the benefit of the Sadrists. Many Sadrists, primarily from the movement’s al-Ahrar bloc, have criticized the sayiroun alliance with the ICP due to its focus on secularism and anti-sectarianism. In Lebanon, attempts at challenging the status quo came mainly from emerging new actors beyond the existing political elite: many political and social activists who thus far have been primarily active outside of political institutions, and representatives of opposition parties of a more or less progressive and left-wing nature (for example, the Lebanese Communist Party). In past months these initiatives have been collectively referred to as “civil society”, a term which alludes to the fact that most of these actors’ political work originates from outside of the state-led political institutions. The approximately 14 “civil society” lists running in different electoral districts mainly constitute different political coalitions joining forces under the name “Kulluna watani” (“We are all the nation”). Similar to the sayiroun alliance, most kulluna watani lists and the individuals on the lists stand for a civil state in opposition to the ruling political system and elite. Nevertheless, their political programme is not free from outside criticism – often by members of civil society and leftist political activists themselves. The main criticism of these lists is that they lack a uniform or convincing political programme, and that candidates jointly running for office represent completely different positions. Many essential issues such as gender equality, the assurance of human and social rights for Lebanese citizens, migrants and refugees, the stance on the Syrian regime and Hezbollah as well as an economic alternative beyond the demand for privatization and a bail-out of the public sector are excluded. A consensus is primarily found in opposing the ruling system and presenting some form of political alternative. Photos of inky thumbs circulated on social media on Lebanon’s election day, many with the explicit invitation to use the opportunity to vote and not leave the fate of the country to the old political elite. Still, voter turnout in Lebanon did not exceed 49.2 percent, attributed by many to the general political disillusion of the potential voters. That said, it was surely not the low voter turnout that represented the lowest low within these elections. By Sunday evening, numerous violations during the voting process had been reported, ranging from violations of the electoral silence, violations of the secrecy of the ballot by pressuring voters, cases of vote buying as well as instances of violence inside and outside many election offices. Moreover, by Sunday evening the results for those hoping for change and reform were rather devastating: only two candidates of the kulluna watani coalition had realistic chances of entering parliament. Out of these two, the Lebanese journalist Joumana Haddad ultimately would not enter parliament after the votes were counted again. Therefore, former Lebanese journalist and television host Paula Yacoubian is the only candidate entering parliament from the kulluna watani coalition in one of the Beirut districts. Other than this, the election result came as a reproduction of the status quo with the same political parties dividing the same seats among each other. Rather surprisingly, the Lebanese Forces doubled its number of seats from 2009, while its rival Kata’eb lost two seats. Rather unsurprisingly, the two dominant Shi’a parties, Harakat Amal and Hezbollah, remained as dominant as before by gaining all the seats reserved for Shia MPs, thereby slightly improving their 2009 results. Negotiations over the new government to be formed and the allocation of ministerial posts are already ongoing, exepctations concerning the possibility of any positive change tend towards zero or even below zero. Lebanese politics is back to its old cycle, Lebanese “civil society” is back to questioning their role in a country that regularly crushes potential political visions and hope. With a rather surprising crackdown on the organization of the Beirut Pride Week by different branches of the Lebanese security forces last month, many civil society actors’ focus shifted towards more issue-based and selective concerns. Politics continue – whether outside or inside parliament. In Iraq, political activists’ profile pictures on social media did not feature an inky thumb but rather the hashtag “lan intakhab” (“I won’t vote”), calling for a boycott of the elections due to how little change offered by the elections, the violations in previous elections, and the controversial electoral law. 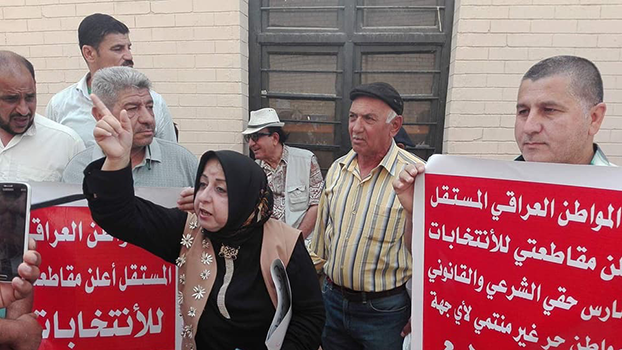 Whether because of the boycott call or a more general disenchantment with politics among many Iraqis, the voter turnout on 12 May was similar to the Lebanese case: Only 44 percent of the Iraqi electorate exercised their right to vote. This marked the lowest voter turnout since the country held its first elections in 2005. Still, the voting of these 44 percent was rather surprising: the sayiroun emerged from the elections as the strongest bloc, capturing 54 seats and beating the coalition led by Prime Minister Haydar al Abadi. Although this result did not position the coalition of Sadrists and Communists as the absolute majority, it is definitely the most powerful political player in parliament, potentially influencing the choice of the next prime minister. The rather surprising victory of the Communist-Sadrist coalition was welcomed by many, representing a symbol of new politics and reform, as well as the potential of a rather unlikely and courageous coalition. Still, questions and ambivalences surrounding the coalition and the interests of each partner remain, and will become increasingly visible over the next couple of months. It is too early to judge or analyse the outcome of both elections; indeed, it is probably even too early to conclude what the reasons for either outcome were. In both countries, discontent with the established system and political elites can be seen particularly in the low voter turnout. Nevertheless, the Lebanese mainly chose to reproduce their status quo, while Iraqi voters appeared ready to try a new approach to politics. The different outcomes must be analysed for each country by itself, and are clearly the result of many factors and developments in each country. The potentials, possibilities and impossibilities of alternative contentious politics inside and outside parliament will be explored over the coming months and years of the legislative term. Currently, the election campaigns and electoral outcomes raise questions mainly regarding the potential of oppositional alternative politics in the context of both countries, i.e. a context of direct and indirect violence, political disenchantment and social and economic injustice. Questions revolve around the possible transformation of the critical political momentum of contentious politics like the hirak in 2015, that is to say, a possible transformation in the direction of an institutionalization or non-institutionalization of these politics. Further questions include which battles oppositional political actors ought to choose and which alliances should be considered in their political process. Clearly, these questions represent a real crossroads for actors advocating for change and an alternative approach in both Iraq as well as Lebanon.